Yole Developpement released a new report covering the OTFT market for flexible displays and other applications. According to Yole, some display makers in Taiwan and China are currently in the process of industrializing OTFT-based displays - flexible LCDs at first, with flexible OLEDs coming within 2-3 years. The mobility of OTFTs are already high enough for LCDs (higher than a-Si) - but still not enough for OLEDs. But in 2-3 years this should be resolved, with low-performance (200 PPI) OLED displays for wearables, some consumer applications and embedded automotive OLEDs possible within 2-3 years. Chunghwa Picture Tubes (CPT) had some pretty interesting prototype OLED displays shown at the Touch Taiwan 2014 trade show last month. We do not have any information regarding how close are these prototypes to commercialization. 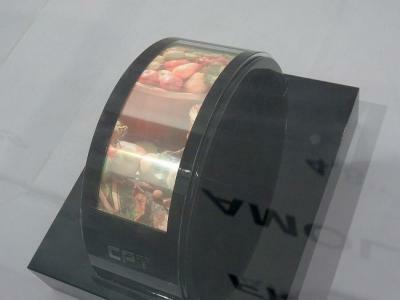 So first up is a flexible AMOLED display. This panel is 4.8" in size and 720x240 resolution (158 PPI). The company did not reveal any more technical details. The company also showed some simpler flexible PMOLED panels, demonstrating their sealing capabilities by immersing them under water (see image below). Researchers from UCLA developed an amorphous oxide semiconductor thin-film transistors (backplane) for LCD and OLED displays. The transistors were produced using a solution process and feature a specially-designed layer with ultra-high density and high electron mobility. 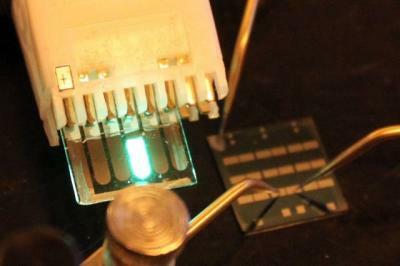 The researchers say that their new process does not require a clean room or expensive equipment, and so can enable a high-performance device that is simple and cheap to produce. The new device offers an electron mobility that is 10 to 20 times greater than a-Si TFTs. It is composed of indium gallium zinc oxide (IGZO) and indium tin zinc oxide, (ITZO). A few weeks ago I posted about Plastic Logic's OTFT-based AMOLED demonstration. While the company's current demo is a simple display (monochrome white), it seems that Plastic Logic believes that OTFT technology is now reaching a performance level for adoption in AMOLED displays. I discussed this with Mike Banach, Plastic Logic's Research Director. Mike (and the rest of the team at PL too, of course) says that organic semiconducting materials have reached a "tipping point" in electrical performance that makes them viable to drive flexible OLED displays. Couple this with the industrial and flexibility benefits of using solution-based organic materials makes it a compelling technology option for display makers looking to establish a position in the flexible display market. A few days ago Samsung held their Analyst Day 2013 with a lot of fascinating information regarding the company's present business and its future plans. It was clear from Samsung Display's presentation that the company sees OLED as the leading future display technology and puts a great emphasis on flexible displays. They see flexible OLED penetration into the mobile display market reaching 40% by 2018 (up from 0.2% in 2013) - this is based on research by DisplaySearch. In fact Samsung Electronics's CEO announced that the company aims to bring fully-foldable screens sometimes in 2015. In the same statement he mentioned that there is still plenty of room for improvement for the Galaxy Gear and it's likely that the company is already developing a wearable device with a flexible AMOLED display. 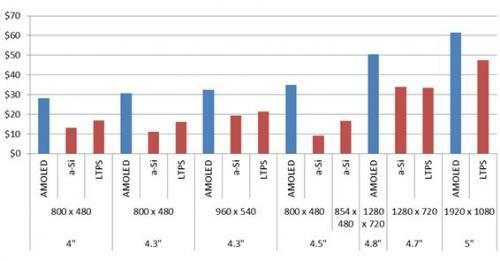 Since CMEL stopped producing AMOLEDs in 2009, it was impossible to get low-volume AMOLED as Samsung and LG will only ship to large-volume applications (mobile phones, cameras, etc). But today Densitron informed us that they started shipping new HVGA (320x480) 3.5" a-Si AMOLEDs panels. Densitron says that the DLA320480AB035F module features 10,000:1 contrast ratio, near 180-degree viewing angle and a brightness of over 200 Candela. It uses Himax's HX5227-A AMOLED driver and includes a MIPI-DBI 8/16/24 bit MPU parallel interface. For applications where high quality video streaming is required, the 8/16/24 data line parallel video (RGB) interface option is available. The PCA-48 line is a 4.5-Gen (730x920 mm) line that incorporates TFE, Ink-Jet Printing, and high vacuum transportation technologies. OTS uses Merck polymer and Small-Molecule materials and their production line supports all substrates (including a-Si using Ignis' technology). OTS that they can deliver and install a complete production line within 12 months, and a single line will be able to produce 40 million smartphone displays in a year. This is the line that AIV-BEX wants to use in their proposed AMOLED production fab. Ignis Innovation announced that samples of its 20" 1296x768 (XGA) AMOLED display will be available in August 2013. Ignis will offer these samples to display makers for evaluation of Ignis' MaxLife compensation technology in their own displays (more on this below). They will sell the display for low volume, demanding applications such as medical imaging and scientific imaging. The 20" AMOLED panels use a-Si backplane and are made by RiTdisplay. The panels are only 1.3mm thick (the complete display module is 3 mm thick). The refresh rate is 240Hz. DisplaySearch expects the AMOLED market to reach $11.3 billion in 2013, up 60% from 2012 ($6.9 billion). The market is still dominate by a single supplier (Samsung Display) and a single customer (Samsung), and it's still too early to tell whether OLEDs can really become a mainstream market. DisplaySearch also released the interesting chart above that shows price comparison between AMOLED and LCD (a-Si and LTPS) panels. Most of the growth in 2013 will come from the 4.99" Full-HD (441 PPI) panel used by the GS4, and DisplaySearch estimates that 52 million of these panels will be produced in 2013 (over $3.2 billion in revenues).